Of the human senses, the sense of smell is the least understood. Now, scientists at the University of Illinois at Urbana-Champaign have sniffed out potential clues to how olfactory receptors in the nose detect odors. Those clues may also explain why dietary zinc deficiencies lead to a loss of smell. Olfactory receptors are proteins that bridge through the cell membrane. 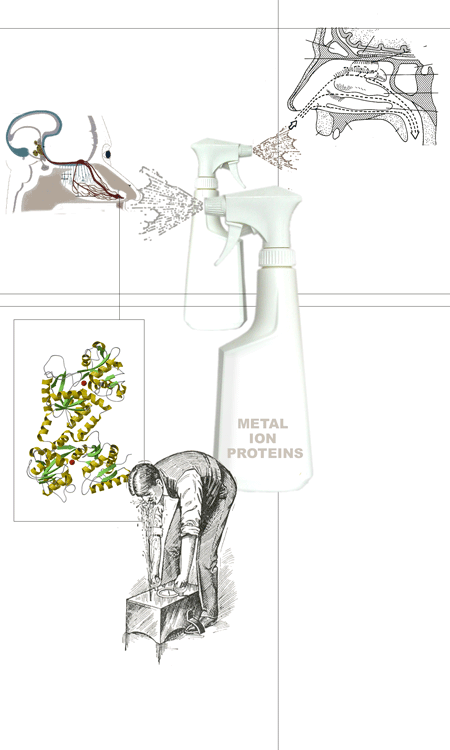 Kenneth S. Suslick and his colleagues - Zaida A. Luthey-Schulten and Jiangyun Wang - investigated the possibility that olfactory receptors are metalloproteins (proteins that contain a metal ion as part of their structure) and have found that the structure of the protein changes dramatically when a zinc or copper ion binds to it. They propose that the olfactory response to an odorant involves this change in structure that pushes and pulls part of the olfactory receptor protein into and out of the cell in a 'shuttlecock' motion. This back-and-forth motion passes information through the cell membrane.